Connecting two devices using RS-232 sounds simple, but nearly every day we help a customer get a converter, isolator or other RS-232 device working by helping correct RS-232 cabling connections. This FAQ will help you troubleshoot and correct similar problems. Usually, inputs are connected to inputs - and outputs to outputs. Often, people do not realize that there are two types of RS-232 ports: DTE and DCE and that, while signal names and pin numbers are the same, signal flow is opposite! The pin labeled TX can be input, and RX the output. The two port types are complementary – the Output signals on a DTE port are Inputs to a DCE port, and Output signals on a DCE port are Inputs to a DTE port. The signal names match each other and connect pin-for-pin. Signal flow is in the direction of the arrows. See the figures below. - Crossover DB9 to DB25 cable provides DCE to DCE connection. Note: Signal directions reversed if both devices are DTE but pin connections are the same. What devices have DTE type RS-232 ports? A DTE device is ”Data Terminal Equipment” and includes Computers, Serial Printers, PLC’s, Video Cameras, Video Recorders, Video Editors, and most devices which are not used to extend communications. Think COMPUTER for DTE. What devices have DCE type RS-232 ports? A DCE device is ”Data Communications Equipment” and includes devices intended to plug directly into a DTE port such as PDA cables, modems and devices that extend communications like a modem, such as RS-422, RS-485, or Fiber Optic Converters or Radio Modems. Think MODEM for DCE. Rule of Thumb - When connecting a DTE device to a DCE device, match the signal names. When connecting two DTE or two DCE devices together, use a Crossover cable. (TD crosses to RD, RTS to CTS, DTR to DSR as shown in Modem to Modem connections. The cable for two computers (DTE) also simulates modem connections to CD/DSR, so it is commonly called a ”Null Modem” cable. How to Check - Are My Devices Wired As DTE or DCE? Use Rule of Thumb - If the device plugs into the computer serial port and works normally, the device is wired as DCE (or the connection cable is a crossover type that makes it work as a DCE). If the device connects to the computer port using a ”null modem” crossover cable, it is wired as DTE. Use RS-232 Line Tester - A quick and easy way to determine the DTE/DCE port type is to use a RS-232 line tester such as B+B SmartWorx Model# 9PMTT. The tester can show the signal state of any active RS-232 data lines using LEDs lighting Red or Green. Active data lines are output from a device; they may be either High or Low. Just plug the tester into either of the two devices, see which lines are lit. Unplug it, then plug it in to the other device, see which lines are lit. See figures. If the device is ”port powered” check the active side, then plug in the port-powered device and see if other (TD or RD) LED is lit. If not, try swapping the leads with a null modem cable, see if the other LED now lights. If not, you may not have enough voltage on the handshaking lines of the port to borrow power from. Use a DC Voltmeter – Technicians with a DC voltmeter can use it to measure the DC level from signal ground (pin #5 on DB9, pin #7 on DB25) on the connector to pin #2 or pin #3. When the unit is powered and not sending data, the output line will have a DC voltage of minus polarity; 3 Volts to 11 Volts will be typical. The other pin will have little or no voltage. For example, measuring -11 Volts on pin#2 of a DB9 connector, and the line is labeled RD or Rx, then the device is wired as DCE. If measuring the voltage on pin#3, it is DTE. Measure pin #2 and pin #3 to Ground (pin # 5 - DB9) (pin #7 -- DB25) on the cable from the first device, then on the device you want to connect. If the cable and device have voltage on the same pin, you need to use a crossover or null modem connector that swaps pins #2 & #3 and the other pins. Electrically active handshaking lines will be negative when not asserted or positive when asserted. (For reference, see line tester figures). Active handshaking lines can be found by measuring each pin for voltage. Output lines will have voltage. On a DTE, DTR and RTS will have voltage if used. On a DCE, DSR and CTS will have voltage and, if a modem with CD (Carrier Detect) and RI (Ring Indicator), these last two will be low until Ring is detected or a Carrier connection is made. If handshaking lines do not have voltage when the device is powered on and ready, and the device does not output them, they may be looped back – RTS to CTS and DTR to DSR. You can turn off the device power and measure for continuity (zero Ohms) between pins to confirm if they are looped back. 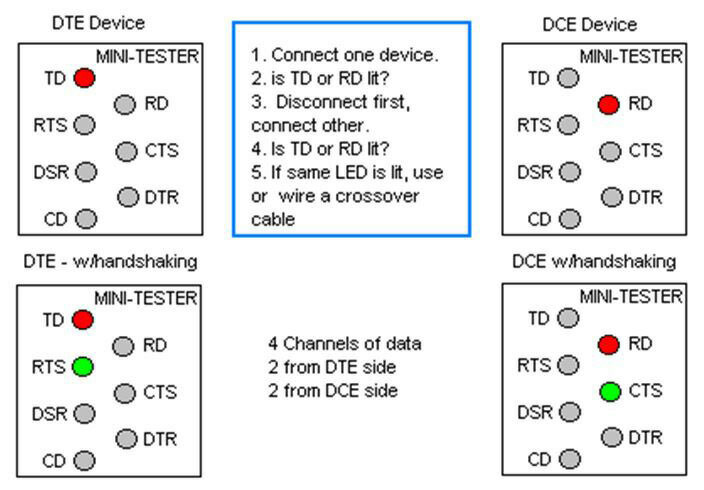 Handshaking lines RTS and CTS not interconnected; DTR and DSR not interconnected. Swap as needed. Each signal required for unit operation must be carried through by the isolator, modem or RS-422 or fiber optic converter. The primary ”2 Channels” for RS-232 are Receive & Transmit. There are 2 data flow control channels – RTS and CTS. If these are missing, data is lost, characters are missing or files scrambled.